Poás Volcano is the second-most visited national park in Costa Rica for one excellent reason: a gently active volcano (and its triplet craters). Here, a turquoise lagoon--the most acidic lagoon on earth--fills the world’s second-widest crater (0.9 miles wide). A second crater, now extinct, houses Botos Lagoon, a cold-water lake. Trails wind through the park, connecting the visitor’s center with the volcano’s craters, cloud forests, and other habitats. Walking to the crater via a paved “trail” (more like a paved walking path). This trail is wheelchair-accessible. Rustic hiking through the cloud forest is also popular, although you’ll need walking/hiking shoes. The blue lagoon. A huge mirador (viewpoint) overlooks the turquoise-blue lagoon. You’ll often wait an hour or more for the steam and clouds to clear for a good view. The Botos Lagoon, which more accurately is a cold-water lake, is the second-most popular sight at Poás Volcano National Park. Its waters are cool, clear and very tranquil. Buy fresh fruit from the chinamos (fruit stands) on the road to Poás. Choose from strawberries, apples, sour cream and local cheeses. City of Alajuela. Poás Volcano National Park is located high (nearly 9,000 feet of elevation) above the city of Alajuela, which is just 30 min outside the capital and home of San José airport (SJO). Poás Volcano National Park is just 16,077 acres in size--one of Costa Rica’s smallest parks, at just 2/3 the size of Disney World. 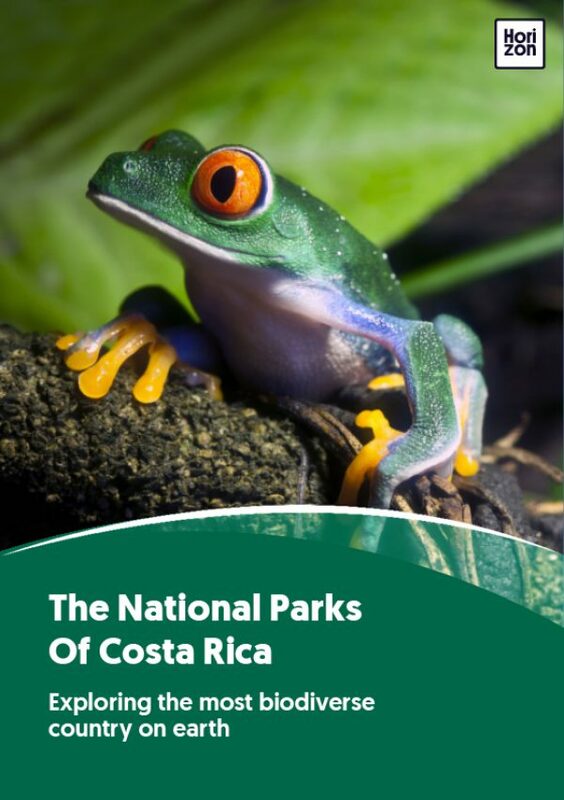 It was established in 1955 (one of the first national parks in Costa Rica); then expanded to its current size on January 25, 1971. Receiving 339,542 annual visitors, Poás is the second-most visited park in Costa Rica, thanks to its proximity to the capital and the airport. Facilities here are plentiful and accessible: a visitor’s center, guarded parking, recreational areas with picnic areas, a cafeteria, gift shop, non-drinking water, and first aid. Wheelchair-friendly paths are well-maintained. The main trail (Crater Trail) measures 1.5 miles and leads from the visitor’s center to the main crater, where the Botos Lagoon trail picks up, winding a half-mile to the cold-water lake and looping through chilly cloud forest and ends at the picnic area. From there, pick up the Escalonia Trail and make your way back to the visitor’s center. Extra time before or after SJO? Stop here! Just an hour or so from the airport, and many tour operators run daily trips to Poás, often combined with stops at Doka Coffee Estate (excellent coffee) and La Paz Waterfall Gardens (spectacular waterfalls and wild animal rescue). Poás Volcano National Park can be a surprise for those who assume Costa Rica is always warm. Here at the park, temperatures range from 12-15 C (54-59 F). Then there’s the wind and the rain (158-197 inches, annually)! It can get quite chilly up here at altitude, so bring a jacket or sweatshirt and an umbrella/raincoat. The rainy season is from May-November, while the “dry season” lasts November-April. Do keep in mind that Poás Volcano National Park is located in the cloud forest, which is essentially high-altitude rainforest, so there’s always a chance of showers. Arrive early, preferably at opening (8 a.m.) for the best chance to see the iconic blue lagoon. Dry season has the best viewing opportunities. Poás Volcano National Park is home to four major habitats: the cloud forest, which occupies the majority of the park’s popular trails, relatively uncommon scrub lands, arrayans (think wind-swept trees and almost moonlike landscapes), and stunted forest. Wildlife sightings are secondary to the crater and lagoon, but that doesn’t mean there’s nothing here to see. There are 80+ bird species, among them the resplendent quetzal, great currasow, flame-throated warblers, golden-hooded tanagers, and squirrel cuckoos. Mammals include Baird’s tapir, squirrels, rabbits and coyotes; and a variety of amphibians and reptiles, including salamanders, frogs and snakes. Poás Volcano National Park is located 31 miles (1-1.5 hours) northwest of San José. To get there, fly into SJO airport, and stay in either San José or Alajuela. The famed Peace Lodge, located in Vara Blanca, is even closer. As Poás Volcano National Park is the second-most visited national park in the country, it’s accessible via public bus, taxi ($60+ from Alajuela), on private tours, or by car (from Alajuela, just follow signs to Poás). There’s one public park entrance, located just 6 miles NW of the town of Poasito.